Conor Washington heads home the opening goal for Posh against Chesterfield. Photo: Joe Dent/theposh.com. Peterborough United manager Graham Westley has described Conor Washington as ‘the best striker in League One’. Washington scored both goals as Posh beat Chesterfield 2-0 at the ABAX Stadium today (December 26) to move back upto fifth place. A thumbs-up from match-winning manager Graham Westley after Posh beat Chesterfield 2-0. Photo: Joe Dent/theposh.com. Washington (23) now has 11 goals in his last 11 appearances and 13 in total this season. He looks set to be a target for Championship clubs during the January transfer window, although Westley believes he could play at Premier League level. “I am sure plenty of Championship clubs are lining up to take Conor,” Westley said. “But I am wondering when the Premier League clubs will start having a look. Conor is the best striker in League One and he is capable of going beyond the Championship. “No matter what problem you put in front of Conor, he has an answer. He has pace to burn, he has great strength and the quality of his finishing is improving all the time. “The big guns will soon take an interest I am sure of that and it won’t affect Conor even though the transfer window is coming along. Westley sprang a selection surprise by fielding flair player Marcus Maddison at left-back today to cover for the absence through unjury of Callum Elder. It proved an inspired choice as Maddison was a deserved winner of the sponsors’ man-of-the-match award after creating the opening goal and playing to a high standard throughout. “It was a team victory today,” Westley added. “But if I had to pick a man-of-the-match I would have probably gone for Marcus. “I told him during the week that I didn’t want him to play left-back, I wanted him to play as a left-sided attacker. And he was excellent. He delivered some great crosses, no more so than the one for the first goal, and he defended well when he had to as well. He made some good, well-timed tackles. “It would be a concern to most League One defenders to see Marcus bearing down on them. He gave a very cultured display for a full-back. “We adapted much better to the difficult blustery conditions today compared to our two previous matches. “I enjoyed the clean sheet. We were dogged and determined at the back. We showed a great desire to keep that clean sheet and I like to see that in a team. Posh are straight back in League One action at leaders Walsall on Monday (December 28) when Westley is likely to make some changes to his starting line-up. 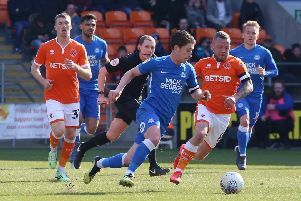 Midfielder Martin Samuelsen and striker Lee Angol are among those with a chance of a recall to the starting line-up after brief substitute appearances today.